I discovered The Way Of The Dragon Or The Way Of The Lamb: Searching for Jesus’ Path of Power in a Church that Has Abandoned It through a Christianity Today article written by Jamin Goggin and Kyle Strobel (see Confronting the Toxic Power in Me). At the time, I was studying the topic of spiritual power and authority, both its true manifestations and sinful distortions. In The Way Of The Dragon Or The Way Of The Lamb, Goggin and Strobel convey an earnest commitment to Christ and love for His church by separating the clean from the unclean in regards to Christian power. They write humbly, confessing their own vacillations between the Christ’s way of power and those of the world, drawing on the wisdom of some exemplary spiritual fathers and mothers. Several of the chapters describe their meetings with J. I. Packer, Dallas Willard, Marva Dawn, John Perkins, Jean Vanier, James Houston, and Eugene Peterson who each contribute key insights into the unbridgeable gap between the way power is used by the world, flesh, and devil and the way of Christ. “What we face in the world today is a self-achieved identity. As Christians, we believe in a given identity, not an achieved one. The Christian is found in Christ. The self-achieved identify is very fragile because we have to sustain it. Nobody else is going to sustain it for me when I have built it up myself. The result of this is a tendency toward narcissism, because there is a depleted sense of self. This is not what God ordained that we should have for an identity” (41, quoting James Houston). We are now in a different sort of wilderness – led out of the world and into the kingdom of Christ – awaiting the promised land that will come when Christ returns… On our day of rest we remember our own leaving behind the land of slavery (the world, the flesh, and the devil), and we fix our hearts on the journey toward the promised land. While Sabbath might have seemed odd, lazy, and utterly counterintuitive, it was God’s way of realigning the hearts of his people to his way. Our actions on the Sabbath day will seem odd and worthless to others as well, but when they are grounded in God’s work to bring us through the wilderness and into his kingdom, they reveal God’s deep recalibration of our hearts to his way” (174, 175). Over and over again, He Who is the Truth prefaced His sayings with, “I tell you the truth…. l tell you the truth…. I tell you the truth.” You may want to run the references in the Scriptures to see how often He did this. One of the truths He tells us is the true condition of our hearts. During the late nineteenth century, while the church’s understanding of the unconscious motivation behind surface actions was vanishing, Sigmund Freud rediscovered this factor and recast it in an elaborate and profound secular mythology. One of the consequences of this remarkable shift is that in the twentieth century pastors have often been reduced to the status of legalistic moralists, while the deeper aspects of the cure of souls are generally relegated to psychotherapy, even among Evangelical Christians. But the structure of sin in the human personality is something far more complicated than the isolated acts and thoughts of deliberate disobedience commonly designated by the word. In its biblical definition, sin cannot be limited to isolated instances or patterns of wrongdoing; it is something much more akin to the psychological term complex: an organic network of compulsive attitudes, beliefs and behavior deeply rooted in our alienation from God. Sin originated in the darkening of the human mind and heart as man turned from the truth about God to embrace a lie about him and consequently a whole universe of lies about his creation. Sinful thoughts, words and deeds flow forth from this darkened heart automatically and compulsively, as water from a polluted fountain. “The Lord saw that the wickedness of man was great in the earth, and that every imagination of the thoughts of his heart was only evil continually” (Gen. 6:5). This is echoed in Jesus’ words: “Either make the tree good, and its fruit good; or make the tree bad, and its fruit bad; for the tree is known by its fruit. You brood of vipers! How can you speak good, when you are evil? For out of the abundance of the heart the mouth speaks. The good man out of his good treasure brings forth good, and the evil man out of his evil treasure brings forth evil” (Mt. 12:33- 35). The human heart is now a reservoir of unconscious disordered motivation and response, of which unrenewed persons are unaware if left to themselves, for “the heart is deceitful above all things, and desperately corrupt; who can understand it?” (Jer. 17:9). It is as if they were without mirrors and suffering from tunnel vision: they can see neither themselves clearly nor the great peripheral area around their immediate experience (God and supernatural reality). At the two most crucial loci of their understanding, their awareness of God and of themselves, they are almost in total darkness, although they may attempt to remedy this by framing false images of themselves and God. Paul describes this darkness of the unregenerate mind: “Now this I affirm and testify in the Lord, that you must no longer live as the Gentiles do, in the futility of their minds; they are darkened in their understanding, alienated from the life of God because of the ignorance that is in them, due to their hardness of heart” (Eph. 4: 17-18). The mechanism by which this unconscious reservoir of darkness is formed is identified in Rom. 1:18-23 as repression of traumatic material, chiefly the truth about God and our condition, which the unregenerate constantly and dynamically “hold down.” Their darkness is always a voluntary darkness, though they are unaware that they are repressing the truth. 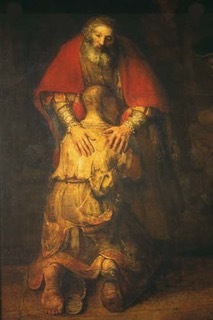 When we pray, as we continually do in PCM, “Help us to lift high your Cross, 0 Lord,” we are crying out for the anointing to preach the good news of Christ’s death for us in such a way as every soul can yield up it deepest sin, its individual sins, its deeply ingrained patterns of sin, — so that these might flow into Christ Crucified and that the soul might receive all that Christ’s death has won for him. Forgiveness of sin, justification, sanctification, the Baptism of the Holy Spirit, and authority over evil and the evil one– all of these things Dr. Lovelace goes on to write about in ways that are profound, yet readily accessible to the mind that is not theologically trained. The theological understanding he brings here is crucial to the healing ministry. I urge all who teach and minister to consider this book as the great resource that it is. One of the reasons I picked it up and finished all 400 plus pages was for its Chapter 8, “How Revivals Go Wrong.” He writes of “aberrant revival” and of the false things that come in to destroy the true. The waters of renewal are badly muddied today, and we are seeing false emphases and imbalances, as well as the outright spurious. Those of you deeply concerned about these matters at this time will appreciate the historical precedents Dr. Lovelace, as historian, points out, and will be better enabled to intercede for the church worldwide.